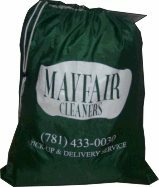 Mayfair Cleaners has provided professional dry cleaning services to the Metro West area for over 30 years. Our company is family owned and operated and is committed to providing excellent services to our loyal customers. Mayfair strives to offer our customers a wide range of dry cleaning and laundry services. We have expanded to offer environmentally friendly dry cleaning, free home pick-up and delivery, as well as professional shirt and laundry services. Mayfair Cleaners is proud to offer its customers a higher standard of cleaning.